In martial arts, especially karate, the concept of "one-strike-one-kill" probably was derived from earlier weapons systems. In Chinese lore dim mak is regarded as the death touch, not necessarily delivered with brute force but bad intentions. Historian and perennial karateka Patrick McCarthy catalogs a plethora of "forbidden" vital points in his research of a classic text in The Bible of Karate: Bubishi. 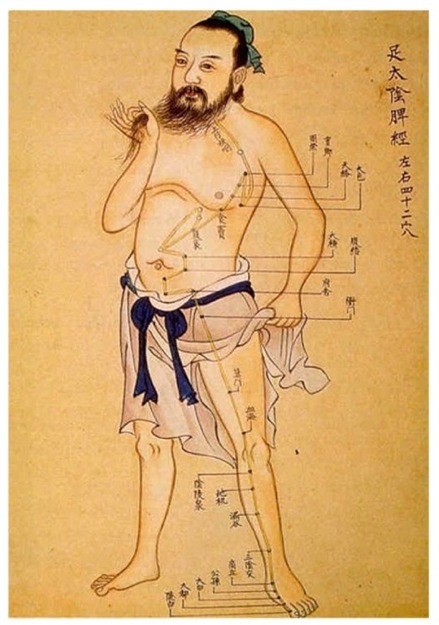 The said vital points were actually discovered by acupuncturists during the Ming dynasty. Knowledge of these areas in time became the foundation for self-defense, intended for doctors and scholars. Chinese martial arts eventually made their way to the island of Okinawa. Okinawan karate has distinct Chinese quan fa roots, and naturally karate has developed its own repertoire of vital strikes that are the stuff of legends. In Okinawan Karate: Teachers, styles and secret techniques, author Mark Bishop describes certain delayed-effect strikes that took their toll on many an overseas visiting trainee that failed to abide by dojo etiquette. Months or even years later these hapless victims would suffer from irreparable internal organ damage or some mysterious disease that could not be explained by Western medicine. In self-defense courses geared towards women, the main target areas are eyes, throat, groin and knees. Supposedly if you kick or strike someone hard enough in the groin he'll pass out. One of Bruce Lee's favorite tricks was a finger jab to the eye, likely a setup for a finishing move. 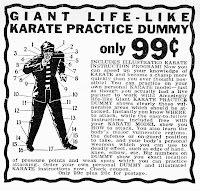 Of course all of this has spawned a market for instant gratification addicts who want to learn "the good stuff" right away without having to devote years to traditional martial arts training. 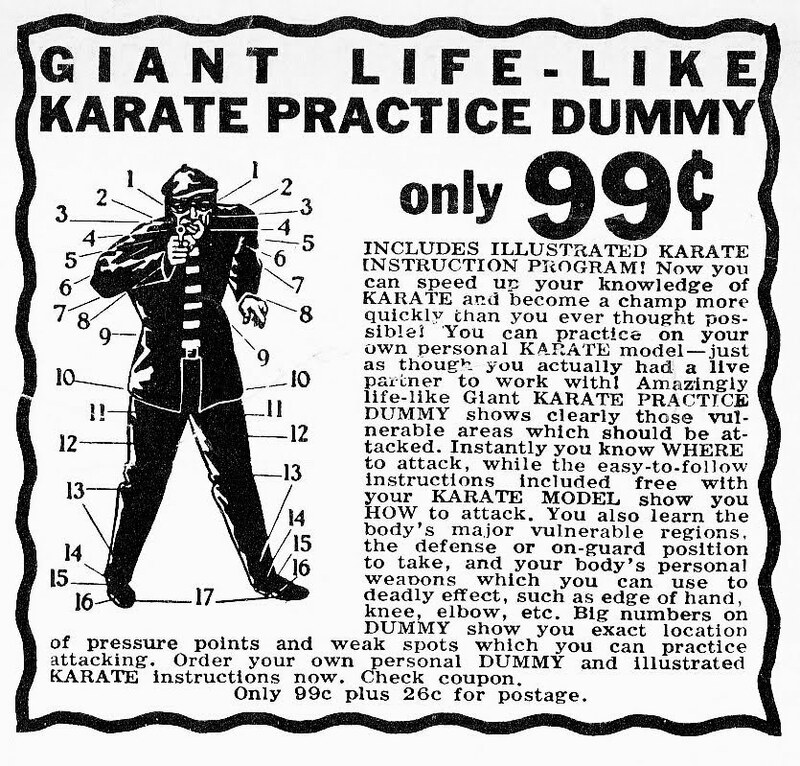 Scores of books and courses found in magazines with titles like "Learn Deadly Strikes" intended to "protect you and your loved ones" have undoubtedly sold millions since the 60s. In the 70s it was the infamous Count Dante, the Deadliest Man Alive, who sold how-to guides on vital area striking methods. More on this particular topic can be found in my Retro Ads post that I wrote in 2006. There is one area of the body that when targeted is a relatively safe peacemaker: the solar plexus. One guy I train with exploits this target area using a variant of Isshinryu's basic 14: step into zenkutsu dachi (long, forward stance) while executing a palm-heel followed by two consecutive roundhouse punches to the body. His version uses the palm heel to deflect an incoming strike, followed by just one - it's all that's needed - hooking ridge hand to the solar plexus. Game over.